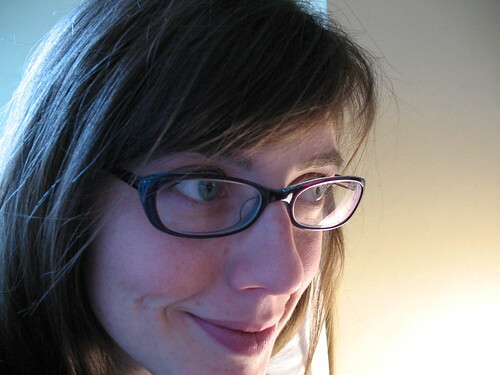 For the last year I’ve had the immense pleasure of becoming a sample knitter for Hannah Fetig of Knitbot fame. I love knitting Hannah’s designs, as they are always clean, simple and elegant. Plus, her samples always feature yummy yarn that please the fibre snob in me. I’d say the only downside to knitting for Hannah is having to ship the finished garments back to her! Well, I was thrilled when she told me she was writing a book of patterns with another lovely lady, Alana Dakos of Never Not Knitting, and needed me to knit two samples for the book’s trunk show (Bayside and Rocky Coast). 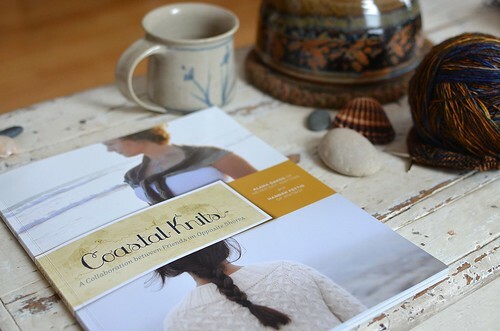 I was even more thrilled when I received my own copy of Coastal Knits. Inspired by their beautiful coastal surroundings, Hannah and Alana have come up with a collection of patterns that reflect the different shapes and textures around them. Hannah lives on the east coast, and her patterns feature nautical cables, shifting sands, and rippling waves. Alana lives on the west coast, and her designs are organic, leafy and lush. Both of these talented ladies are masters at creating garments that are wearable, classic, but always with a little detail that makes them special. I can honestly say that I would love to knit and wear every single one of these designs. It’s hard to know what to knit first, but I may start with Alana’s Wildflower Cardigan. Though I’ve been a longtime listener and fan of Alana’s podcast, I’ve never had a chance to knit one of her beautiful designs. Wouldn’t it be divine in the golden Madelinetosh Pashmina seen here? Drooooool. Coastal Knits not only includes lovely patterns, but amazing eye candy. It features beautiful photography and graphic design, and the quality of the printing is top notch. It’s the kind of book you want to leave laying around so you can be transported into another world (when you desperately need a "Calgon take me away" moment). I loved reading about the places that inspired Hannah and Alana, and also about the local yarns that were used to make many of the garments featured in the book. Well, wouldn’t you like to have a copy of your very own? Of course you would. Just leave a comment here before Monday, November 14th and I will randomly choose and announce the lucky winner. Good luck! And you can read other reviews on the Coastal Knits blog tour here. I am absolutely smitten by that Wildflower Cardigan! Of course I would! I'm obsessed with the Rocky Coast Cardigan! I have lurked on your blog for a long time, so I'm excited to take the plunge and actually comment. Thanks for the offer! Such a beautiful collaboration! The Rocky Coast cardigan is absolutely smashing -- so wearable and cozy in addition to being stylish and fashion-forward. Yes, i'd absolutely love a copy, many thanks for the giveaway. Me, please! Wildflower Cardigan in MadTosh pashima would be heavenly. It's interesting that you mention how clean and clear Hannah's patterns are because a friend just emailed me about that very fact! ohhh, very jealous! i have been admiring many of the books patterns for weeks now. can't wait to see! I too am a first time poster but long time lurker. I love your blog! And I love this book! I think my favorite is the Rocky Coast Cardiagn but everthing else in it is a close second! I want this book so badly and I want to knit that exact sweater too! Although I want to knit every single one. So many pretty sweaters! I would love to win a copy. You are fortunate indeed to have the opportunity to knit for such a wonderful designer. I'd love to be the winner of your generous giveaway. These patterns are so gorgeous! Would love to knit the Rocky Coast Cardigan and appreciate the opportunity to win the book. Oh, there are so many great patterns in the book! Thanks for the chance to win a copy! Did we ever see your rocky coast??? I don't remember seeing it? I agree, that Wildflowers cardi is devine in the golden pashmina! I love the patterns in this book. It is totally on my want list. Would love to get this book. Have been looking at it for a while. I have to admit I have a total crush on the Rocky Coast. And how fun that you got to knit the sample! thank you for this giveaway. this is such a beautiful collection of patterns. such as BEAUTIFUL book! i am dying to get my hands on this so i can start knitting away! thanks for the giveaway! It is a beautiful book, and I would love to win a copy. As a New Englander now stranded in the midwest, I would love to see some ocean again! This is a gorgeous book!! would love a copy of this famed book. lucky you to play with all those beautiful yarns. I would be reluctant to return the finished product too! Oh, my, yes!! I absolutely would love a copy of this book! If that gorgeous cardigan is any indication, it'll be well worth having!! i guess if I won the book I would have no excuse but to knit that lovely sweater. So many gorgeous knits. If a knitter won this book, how would she begin to choose a starting project? I'd love a copy of this book, the cardigan you pictured is gorgeous!! goodness, i have only heard ah-mazing things about this book. drool worthy indeed! i've leafed through it, and i agree with you, i think everything in this book has to be knit. thanks for this opportunity! woot woot! The Wildflover Cardigan is my favourite too, I think, though there is fierce competition to be absolute favourite. It would be amazing for Spring is a crisp green lambs wool. That Wildflower Cardigan is adorable and I'd so like to have my own copy of the book! It looks like a lovely book! I especially love the Gnarled Oak cardigan! I would love to win this nice book! What a beautiful book. Thank you for the opportunity to win a copy! What a lovely book, I am new to knitting but would love an opportunity to win the book. I love the simple designs with nature inspired details. what an absolutely wonderful book! and such a thoughtful giveaway :) my knitting skills have been expanding, so it would be a dream to win a book full of so many wonderful projects!!! Have the samples you knitted been photographed for the book? This is too cool!!! This book is on my "how to spend my Christmas bonus" list!! What a fantastic give away. I am completely in love with the ball of yarn in your first photo. Absolutely beautiful--you are going to share details on that,right?? The book looks gorgeous! Thanks for having this getaway. I've lived on both coasts and would love to honor each by knitting the gorgeous designs that Hannah and Alana have in their collection. I would love to own this book too. Oh, my goodness! What a beautiful collection of lovely designs. Thanks so much for offering us the chance to win it! I would love to win this book. I love every design in this book and would love to knit every one! Thanks for the great giveaway!! This truly is a lovely book... I can't wait to get a copy for my knitting shelf! The previews I've seen of this book are gorgeous. I can't wait to get my hands on this one. that is lovely! i'm such a sucker for that straw/old gold color. of course, i think it would also look gorgeous in one of your trademark colors, like a greyish-seafoam. Love your "droool" comment about the cardigan. Thanks for hosting a contest for such a lovely book! I have really enjoyed this blog tour and would love to win a copy! Would love to be picked for your giveaway! Lovely! Would love to win a copy of this book! I love Hannah and Alana's designs, and to have them in one place, together, well, AWESOME!!! That Wildflower Cardigan is super cute. I would knit it first as well. I have my fingers crossed for the book! Thanks! I love this book !! It would be awesome to win my very own copy !! How great to be able to test knit these amazing patterns. I would love to win a copy of this beautiful book! Love the patterns in this book! Yay yay, I hadn't heard about their book until reading about it on your blog, but now you have me excited! i didn't realize (or had forgotten) that you test knit the Rocky Coast sweater - that's such a gorgeous sweater. I'm so excited to see this book. Thank you for hosting a giveaway! The sweaters in this book are just gorgeous! This is such a beautiful book! I love the Rocky Coast Cardigan, it's simple and elegant and very flattering. I follow Alana's podcast and the Featherweight Cardigan is on my queue, so of course and I've been eyeing the book ever since I first heard about it. I especially like the Water's Edge cardigan and the Sand and Sea shawlette. Thank you for the giveaway! I'm drooling over the beautiful golden cardigan! It's a really lovely collection. Nice that you had a part in it! nothing better for a long winter than a great knitting book! thx!! Thanks for the chance to win this book. Gorgeous patterns! I would love to get my hands on that book! I am a new reader and up until this moment have been a bit of a lurker. Well, this giveaway is the perfect way to come out of my shell. I enjoy visiting this space. Your photos and words create a perfectly calm space. The book looks so beautiful, thank-you for the opportunity to win it! What a fantastic book. I love the Rocky Coast sweater in particular but I love most the entire book. The projects in this book look DIVINE! I love the sweaters in this book - can't wait to get my hands on the book so that I can knit them! This looks like a gorgeous book! What a wonderful idea...I too would love a chance to win this book! Nicole, I've just found you through Resurrection Fern, your photos were beautiful so I clicked on over and discovered your knitting talent...I'm just reawakening my knitting skills(?) and would love to own this lovely new book. I would love to win this book. The patterns look fabulous! I would love a chance to knit one of these designs! Beautiful book... these are two of my favorite designers! I can't wait to get my hands on this book. Maybe I'll win it! Thanks for the chance. Oh,another fabulous collaboration. The talent in the knitting world these days is extraordinary. I'd love the chance to win this book, s'il vous plait! The book looks wonderful! thank you for the a lovely giveaway. Love the patterns, any one of them would make a great present for my mother or my daughter.They are timeless! What a beautiful book! I especially love the Rocky Coast cardigan. I would love the chance to win this lovely book (if you are accepting uk entries). I am in love with Wildflower cardigan. I love the simplicity and the elegance of this cardigan. As has become a well known Fetig Hannah post.It very interesting weave knit BOT samples. I love knitting Hannah's design, because they are always clean, simple and elegant.